Parliament enjoyed a rarely emotional moment as Zoran Zaev took the floor to tell the story of his country, distilling 27 years of hoping, waiting and failing to make progress into an optimistic 20-minute speech that received a standing ovation from MEPs. After engaging in a toxic debate about Hungary and listening to Jean-Claude Juncker’s uninspired, underwhelming speech, it was a welcome break and music for the ears of all Europhiles. “Since 1991, when I was 17, I’ve been dreaming of Macedonia becoming a part of Europe. Now, 27 years later, I am addressing the European Parliament as prime minister, on behalf of my people, in my Macedonian language. We are grateful for this historic moment and proud of having a chance to realise this,” he said. Parliament President Antonio Tajani reassured him that “you will have our support, your country will have our support” in efforts to join NATO and the EU and bolster stability in the Balkans, one of Europe’s poorest regions, riddled with lingering ethnic hatred and unresolved problems. And that’s about as good as it gets. As there is a small glitch. After years of failed, UN-sponsored talks on how to resolve a name dispute between Macedonia and Greece, Zaev and Alexis Tsipras struck a historic deal in June, agreeing to the name “Republic of North Macedonia”. But the deal is opposed by Macedonia’s right-wing opposition VMRO, a party that is part of the EPP family and had been in power for a decade, before Zaev took over. Greece’s opposition party is not particularly supportive of the deal either. And in Macedonia, the deal needs to be ratified in a crucial referendum on 30 September. Polls indicate that around 41% of Macedonians, including the Albanian minority that’s overwhelmingly in favour, support the deal. 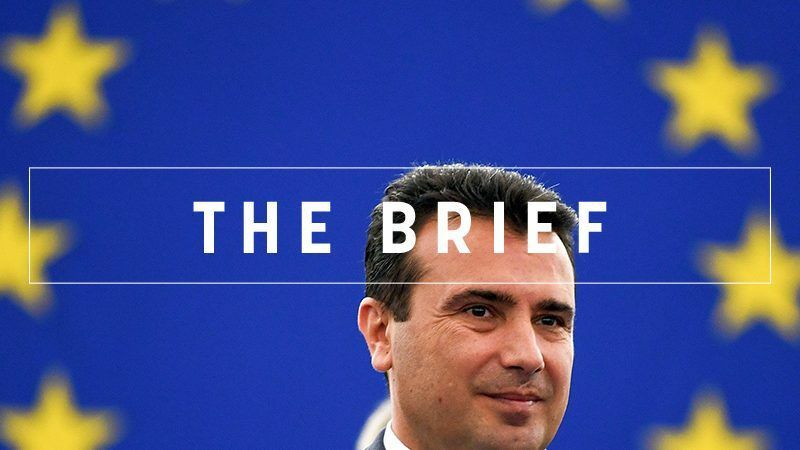 Should the agreement be rejected in Macedonia, frankly, there are few options left, and the small, landlocked country will remain a source of instability. With that in mind, Zaev’s inspired speech was probably addressed to the audience back home, as much as to the Europarlamentarians. The scary thing about AI is that it is hard to predict how far technology will advance – and whether it will be possible to politically control it. Scepticism prevails among Germans, a new study shows. MEPs called for a global ban on ‘killer robots’, weapons that kill without a human deciding to pull the trigger. The UN has put European migration policy in its sights, drawing a strong response from Vienna and Rome. EU security Commissioner Julian King said plans to crack down on online terrorist content is “not censorship”, after Jean-Claude Juncker revealed the strategy in his SOTEU speech. The Austrian far-right said it does not want to go into bed with Donald Trump’s former adviser, Steve Bannon, over forming a pan-European right-wing movement. A recent study by Greenpeace highlights the lack of transparency in EU funds for fossil fuel and nuclear power plants. Italy, meanwhile, withdraws objections to EU power market reform. Russia had found the two men accused by the UK over Salisbury poisoning. President Vladimir Putin says the men are just ‘simple people’ as you and me. The US Secretary of Commerce cancelled a meeting with member states’ permanent representatives to discuss EU-US trade talks as he returned back to the US due to hurricane Florence. Product reformulation, rather than taxes, has brought tangible results for public health, according to Food Drink Ireland, the main trade association for the food and drink industry. Ryanair’s CEO warned that a hard Brexit will ground flights between Britain and Europe for days. Maybe the strikes are emergency training for that very situation. A delegation of the Venice Commission visits Romania in preparation of an opinion concerning the recent concerns over judiciary changes that could pose a threat to the rule of law.